On 30 April 1898 the soprano Aaltje Noordewier-Reddingius performed seven songs by Alphons Diepenbrock in the Amsterdam Concertgebouw. One of them was the sonnet Die Liebende schreibt (The Lover Writes, March 1887), which ranks among the most interesting songs from his early period. As it was Diepenbrock’s first concert as a lied composer, he received a fair amount of attention in the press. The song has been transmitted in various versions and transpositions. Although conceived as a song for contralto or mezzo-soprano (in B major), Diepenbrock wrote a revised version (in D major) for Aaltje Noordewier in 1897. Autograph A-35(5) and semi-autograph A-80(10) once belonged to her. 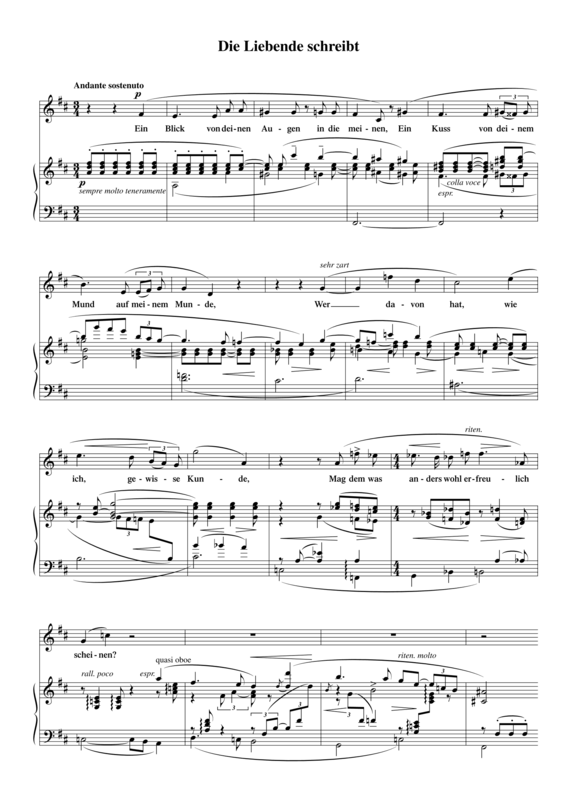 As she became an advocate of Diepenbrock’s compositions, Die Liebende schreibt was published in a version for soprano in 1905 and dedicated to her in the printed edition. Thus the Hymn for violin (RC 44) and eleven songs by Diepenbrock – including Die Liebende schreibt – were published in October 1905. Seven years later Diepenbrock rewrote the song again, this time for the Hungarian contralto Ilona Durigo who had performed Liebesklage (Love’s Lament, RC 95). This last version of Die Liebende schreibt (in B major) was published in 1955. The piano interludes accentuate Goethe’s sonnet form. However, Diepenbrock’s setting closely follows the text. The rhythmic adjustments in the vocal part of later versions show his continuous attempts at refining the declamation of the text. In several cases, melodic changes are connected with significant harmonic changes. For instance, the half-diminished seventh chord, which was already an important means of depicting the text in some of Diepenbrock’s earliest songs, is also used as a means of expression in later versions of Die Liebende schreibt. For example, the beginning of the third verse “Die Träne trocknet wieder unversehens” (The tear suddenly dried again) is given more expression through the combination of a grace note and a half-diminished seventh chord on “Träne” (tear). Compared to other songs from this period by Diepenbrock, the piano accompaniment of Die Liebende schreibt is remarkably transparent. The piano accompaniment of this song should not be regarded as a piano part, but as the piano reduction of an orchestral accompaniment with strings, woodwinds and harp. The rhythmic and dynamic nuances should follow the declamation throughout. Die einzige: da fang' ich an zu weinen. Dein freundlicher zu mir; gib mir ein Zeichen! 30 apr 1898: Eerste uitvoering van Ik ben in eenzaamheid niet meer alleen (RC 41), Écoutez la chanson bien douce (RC 40), Die Liebende schreibt (RC 20), Hinüber wall' ich (RC 37), Lied der Spinnerin (RC 42), Ave Maria (RC 23) en Canticum “O Jesu ego amo te” (RC 29) door Aaltje Noordewier-Reddingius met begeleiding van Anton Tierie tijdens een soiree in de Kleine Zaal van het Concertgebouw te Amsterdam, waarbij Josephine Royaards-Spoor gedichten van Willem Kloos, H.J. Boeken, Bredero en Vondel voordraagt.